the nytpicker: We Know It's Not As Important As Woodstock To NYT, But 70 Years Ago Today, Hitler Invaded Poland And Started World War II. 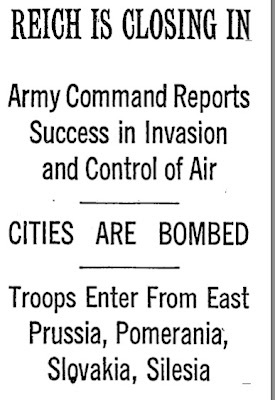 We Know It's Not As Important As Woodstock To NYT, But 70 Years Ago Today, Hitler Invaded Poland And Started World War II. That was the lead headline of the September 2, 1939 NYT front page. Here's an excerpt from the story that followed, by Otto D. Tolischus. Tolischus covered Nazi Germany for the NYT until he was expelled in 1940, the year he won the Pulitzer Prize for his Berlin dispatches. According to Wikipedia, he then moved to Japan for the NYT, where he was arrested, imprisoned and tortured for five months by the Japanese shortly after the Pearl Harbor attack. Hmmm, one column hed. 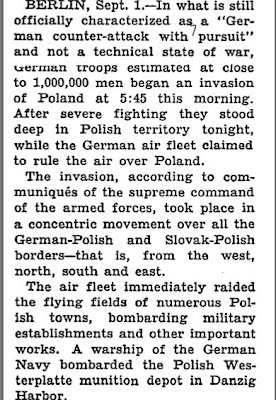 And a truly memorable lede that starts off citing the ludicrous German propaganda rather than calling the obvious: "In what is officially still characterized as a 'German counter-attack with a pursuit' and not a technical state of war..." a million German troops and invaded Poland this morning. So ol' Otto D. and his timid editors kinda missed the point about, uh, World War II having commenced. "officially still characterized" sounds like sarcasm to me. I think they understood what might be coming. The second para calls it an "invasion," no hedging, no timidity. Can editors be so unambiguous today, I wonder? Sarcasm? Come on. The lede and hed should have said, essentially, Germany Invades Poland. All the facts were clear at the time of publication. A million troops invaded Poland. "Invasion" belonged in the lede, not the second graf. No excuse for hedging that. When did it get called WWII? When did hitler die, and how, and whose word am I to trust? A good day's work, supreme command has everybody blinded. This comment regards the post that was up on your site briefly today (Saturday) regarding a NYT reporter. I am not going to repeat what it said. I only want to say that I commend the NYTPicker for taking the post down. Probably this wasn't an easy decision. BUT IT WAS THE RIGHT ONE. My respect for NYTPicker just went way up. Yet another missing post?! What do you know. If you can dish it out, you better be able to take it. Don't be a chicken. If you're going to blather on and on for paragraphs complaining about a story, you better be ready for someone else to do the same to you.